For the Northern War, see Flagstaff War. Memorial in the Auckland War Memorial Museum for those who died, both European and Māori, in the New Zealand Wars. "Kia mate toa" can be translated as "fight unto death" or "be strong in death", and is the motto of the Otago and Southland Regiment of the New Zealand Army. The flags are that of Gate Pā and the Union Flag. 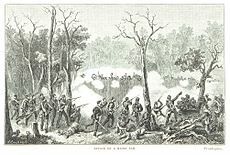 The New Zealand Wars were a series of armed conflicts that took place in New Zealand from 1845 to 1872 between the New Zealand government and allied Māori on one side and Māori people and Māori-allied settlers on the other. Until at least the 1980s, they were commonly referred to as the Land Wars or the Māori wars; the historian James Belich was one of the first to refer to them as the "New Zealand wars", in his 1987 book The New Zealand wars and the Victorian interpretation of racial conflict. Though the wars were initially localised conflicts triggered by tensions over disputed land purchases, they escalated dramatically from 1860 as the government became convinced it was facing united Māori resistance to further land sales and a refusal to acknowledge Crown sovereignty. The colonial government summoned thousands of British troops to mount major campaigns to overpower the Kīngitanga (Māori King) movement and also acquire farming and residential land for British settlers. Later campaigns were aimed at quashing the so-called Hauhau movement, an extremist part of the Pai Mārire religion, which was strongly opposed to the alienation of Māori land and eager to strengthen Māori identity. At the peak of hostilities in the 1860s, 18,000 British troops, supported by artillery, cavalry and local militia, battled about 4,000 Māori warriors in what became a gross imbalance of manpower and weaponry. Although outnumbered, the Māori were able to withstand their enemy with techniques that included anti-artillery bunkers and the use of carefully placed pā, or fortified villages, that allowed them to block their enemy's advance and often inflict heavy losses, yet quickly abandon their positions without significant loss. Guerrilla-style tactics were used by both sides in later campaigns, often fought in dense bush. Over the course of the Taranaki and Waikato campaigns, the lives of about 1,800 Māori and 800 Europeans were lost, and total Māori losses over the course of all the wars may have exceeded 2,100. Violence over land ownership broke out first in the Wairau Valley in the South Island in June 1843, but rising tensions in Taranaki eventually led to the involvement of British military forces at Waitara in March 1860. The war between the government and Kīngitanga Māori spread to other areas of the North Island, with the biggest single campaign being the invasion of the Waikato in 1863–1864, before hostilities concluded with the pursuits of Riwha Tītokowaru in Taranaki (1868–1869) and guerrilla fighter Te Kooti Arikirangi Te Turuki on the east coast (1868–1872). Although Māori were initially fought by British forces, the New Zealand government developed its own military force, including local militia, rifle volunteer groups, the specialist Forest Rangers and kūpapa (pro-government Māori). The government also responded with legislation to imprison Māori opponents and confiscate expansive areas of the North Island for sale to settlers, with the funds used to cover war expenses—punitive measures that on the east and west coasts provoked an intensification of Māori resistance and aggression. The 1840 Treaty of Waitangi guaranteed that individual Māori iwi (tribes) should have undisturbed possession of their lands, forests, fisheries and other taonga (treasures) in return for becoming British subjects, selling land to the government only and surrendering sovereignty to the British Government. Historians, however, have debated whether Māori signatories fully understood this last point, due to the possible mistranslation of the word "sovereignty" in the treaty copies. The majority of Māori wanted to sign in order to consolidate peace and in hopes of ending the long intertribal Musket Wars (1807–1842). They also wished to acquire the technological culture of the British. All pre-treaty colonial land-sale deals had taken place directly between two parties. In the early period of contact, Māori had generally sought trade with Europeans. The British and the French had established mission stations, and missionaries had received land from iwi for houses, schools, churches, and farms. Traders, Sydney businessmen and the New Zealand Company had bought large tracts of land before 1840, and the British government at Westminster became concerned about protecting Māori from exploitation. As part of the Treaty of Waitangi, colonial authorities[which?] decreed that Māori could sell land only to the Crown (the Right of Pre-emption). But as the New Zealand colonial government, pressured by immigrant European settlers, tried to speed up land sales to provide farmland, it met resistance from the Kīngitanga (Māori King) movement that emerged in the 1850s and opposed further European encroachment. Governor Thomas Gore Browne's provocative purchase of a disputed block of land at Waitara in 1859 set the government on a collision course with the Kīngitanga movement, and the government interpreted the Kīngitanga response as a challenge to the Crown's authority. Governor Gore Browne succeeded in bringing 3500 Imperial troops from the Australian colonies to quash this perceived challenge, and within four years a total of 9,000 British troops had arrived in New Zealand, assisted by more than 4,000 colonial and kūpapa (pro-government Māori) fighters as the government sought a decisive victory over the "rebel" Māori. The use of a punitive land confiscation policy from 1865, depriving "rebel" Māori of the means of living, fuelled further Māori anger and resentment, fanning the flames of conflict in Taranaki (1863–1866) and on the east coast (1865–1866). The various conflicts of the New Zealand wars span a considerable period, and the causes and outcomes differ widely. The earliest conflicts in the 1840s happened at a time when Māori were still the predominant power, but by the 1860s settler numbers and resources were much greater. From about 1862 British troops began arriving in much greater number, summoned by Governor George Grey for his Waikato invasion, and in March 1864 total troop numbers peaked at about 14,000 (9,000 Imperial troops, more than 4,000 colonial and a few hundred kūpapa). The first armed conflict between Māori and the European settlers took place on 17 June 1843 in the Wairau Valley, in the north of the South Island. The clash was sparked when settlers led by a representative of the New Zealand Company—which held a false title deed to a block of land—attempted to clear Māori off the land ready for surveying. The party also attempted to arrest Ngāti Toa chiefs Te Rauparaha and Te Rangihaeata. Fighting broke out and 22 Europeans were killed, as well as four to six Māori. Several Europeans were slain after being captured. In early 1844, the new Governor, Robert FitzRoy, investigated the incident and declared the settlers were at fault. The Wairau Affray—described as the Wairau Massacre in early texts—was the only armed conflict of the New Zealand Wars to take place in the South Island. The Flagstaff War took place in the far north of New Zealand, around the Bay of Islands, between March 1845 and January 1846. In 1845 George Grey arrived in New Zealand to take up his appointment as governor. At this time Hōne Heke challenged the authority of the British, beginning by cutting down the flagstaff on Flagstaff Hill at Kororāreka. The flagstaff had previously flown the colours of United Tribes of New Zealand but now carried the Union Jack and therefore symbolised the grievances of Heke and his ally Te Ruki Kawiti, as to changes that had followed the signing of the Treaty of Waitangi. There were many causes of the Flagstaff War and Heke had a number of grievances in relation to the Treaty of Waitangi. While land acquisition by the Church Missionary Society (CMS) had been controversial, the rebellion led by Heke was directed against the colonial forces with the CMS missionaries trying to persuade Heke to end the fighting. Despite the fact that Tāmati Wāka Nene and most of Ngāpuhi sided with the government, the small and ineptly led British had been beaten at Battle of Ohaeawai. Grey, armed with the financial support and far more troops armed with 32-pounder cannons that had been denied to FitzRoy, attacked and occupied Kawiti's fortress at Ruapekapeka, forcing Kawiti to retreat. Heke's confidence waned after he was wounded in battle with Tāmati Wāka Nene and his warriors, and by the realisation that the British had far more resources than he could muster, including some Pākehā Māori, who supported the colonial forces. After the Battle of Ruapekapeka, Heke and Kawiti were ready for peace. It was Tāmati Wāka Nene they approached to act as the intermediary to negotiate with Governor Grey, who accepted the advice of Nene that Heke and Kawiti should not be punished for their rebellion. The fighting in the north ended and there was no punitive confiscation of Ngāpuhi land. The Hutt Valley campaign of 1846 came as a sequel to the Wairau Affray. The causes were similar—dubious land purchases by the New Zealand Company and the desire of the settlers to move on to land before disputes over titles were resolved—and the two conflicts shared many of the same protagonists. 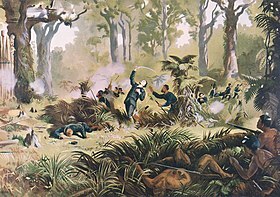 The campaign's most notable clashes were the Māori dawn raid on an imperial stockade at Boulcott's Farm on 16 May 1846 in which eight British soldiers and an estimated two Māori died, and the Battle of Battle Hill from 6–13 August as British troops, local militia and kūpapa pursued a Ngāti Toa force led by chief Te Rangihaeata through steep and dense bushland. Ngāti Toa chief Te Rauparaha was also taken into custody during the campaign; he was detained without charge in Auckland for two years. The bloodshed heightened settlers' fears in nearby Wanganui, which was given a strong military force to guard against attack. In April 1847 an accidental shooting of a minor Wanganui Māori chief led to a bloody revenge attack on a settler family; when the perpetrators were captured and hanged, a major raid was launched on the town as a reprisal, with homes plundered and burned and livestock stolen. Māori besieged the town before mounting a frontal attack in July 1847. A peace settlement was reached in early 1848. The catalyst for the First Taranaki War was the disputed sale to the Crown of a 240 hectare block of land at Waitara, despite a veto by the paramount chief of Te Āti Awa tribe, Wiremu Kīngi, and a "solemn contract" by local Māori not to sell. Governor Browne accepted the purchase with full knowledge of the circumstances and tried to occupy the land, anticipating it would lead to armed conflict, and a demonstration of the substantive sovereignty the British believed they had gained in the 1840 Treaty of Waitangi. Hostilities began on 17 March 1860. The war was fought by more than 3,500 imperial troops brought in from Australia, as well as volunteer soldiers and militia, against Māori forces that fluctuated between a few hundred and about 1,500. After a series of battles and actions the war ended in a ceasefire, with neither side explicitly accepting the peace terms of the other. Total losses among the imperial, volunteer and militia troops are estimated to have been 238, while Māori casualties totalled about 200. Though there were claims by the British that they had won the war, there were widely held views at the time they had suffered an unfavourable and humiliating result. Historians have also been divided on the result. Historian James Belich has claimed that Māori succeeded in thwarting the British bid to impose sovereignty over them, and had therefore been victorious. However, he also states that the Māori victory was a hollow one, leading to the invasion of the Waikato. Governor Thomas Gore-Browne began making arrangements for a Waikato campaign to destroy the Kīngitanga stronghold at the close of the First Taranaki War. Preparations were suspended in December 1861 when he was replaced by Sir George Grey, but Grey revived plans for an invasion in June 1863. He persuaded the Colonial Office in London to send more than 10,000 Imperial troops to New Zealand and General Sir Duncan Cameron was appointed to lead the campaign. Cameron used soldiers to build the 18 km-long Great South Road to the border of Kīngitanga territory and on 9 July 1863 Grey ordered all Māori living between Auckland and the Waikato take an oath of allegiance to Queen Victoria or be expelled south of the Waikato River; when his ultimatum was rejected the vanguard of the army crossed the frontier into Kīngitanga territory and established a forward camp. A long series of bush raids on his supply lines forced Cameron to build an extensive network of forts and redoubts through the area. In a continual buildup of force, Cameron eventually had 14,000 British and colonial soldiers at his disposal as well as steamers and armoured vessels for use on the Waikato River. They fought a combined Māori contingent of about 4,000. Cameron and his Kīngitanga foe engaged in several major battles including the Battle of Rangiriri and a three-day siege at Orakau, capturing the Kīngitanga capital of Ngaruawahia in December 1863, before completing their Waikato conquest in April 1864. The Waikato campaign cost the lives of 700 British and colonial soldiers and about 1,000 Māori. The Kīngitanga Māori retreated into the rugged interior of the North Island and in 1865 the New Zealand Government confiscated about 12,000 km2 of Māori land (4% of New Zealand's land area) for white settlement—an action that quickly provoked the Second Taranaki War. Between 1863 and 1866 there was a resumption of hostilities between Māori and the New Zealand Government in Taranaki, which is sometimes referred to as the Second Taranaki War. The conflict, which overlapped the wars in Waikato and Tauranga, was fuelled by a combination of factors: lingering Māori resentment over the sale of land at Waitara in 1860 and government delays in resolving the issue; a large-scale land confiscation policy launched by the government in late 1863; and the rise of the so-called Hauhau movement, an extremist part of the Pai Marire syncretic religion, which was strongly opposed to the alienation of Māori land and eager to strengthen Māori identity. The Hauhau movement became a unifying factor for Taranaki Māori in the absence of individual Māori commanders. The style of warfare after 1863 differed markedly from that of the 1860–1861 conflict, in which Māori had taken set positions and challenged the army to an open contest. From 1863 the army, working with greater numbers of troops and heavy artillery, systematically took possession of Māori land by driving off the inhabitants, adopting a "scorched earth" strategy of laying waste to Māori villages and cultivations, with attacks on villages, whether warlike or otherwise. Historian Brian Dalton noted: "The aim was no longer to conquer territory, but to inflict the utmost 'punishment' on the enemy; inevitably there was a great deal of brutality, much burning of undefended villages and indiscriminate looting, in which loyal Maoris often suffered." As the troops advanced, the Government built an expanding line of redoubts, behind which settlers built homes and developed farms. The effect was a creeping confiscation of almost 4,000 km2 (1,500 sq mi) of land, with little distinction between the land of loyal or rebel Māori owners. The outcome of the armed conflict in Taranaki between 1860 and 1869 was a series of enforced confiscations of Taranaki tribal land from Māori blanketed as being in rebellion against the Government. East coast hostilities erupted in April 1865 and, as in the Second Taranaki War, sprang from Māori resentment of punitive government land confiscations coupled with the embrace of radical Pai Marire expression. The religion arrived on the east coast from Taranaki in early 1865. The subsequent ritual killing of missionary Carl Volkner by Pai Mārire (or Hauhau) followers at Opotiki on 2 March 1865 sparked settler fears of an outbreak of violence and later that year the New Zealand government launched a lengthy expedition to hunt for Volkner's killers and neutralise the movement's influence. Rising tensions between Pai Mārire followers and conservative Māori led to a number of wars between and within Māori iwi, with kūpapa armed by the government in a bid to exterminate the movement. Major conflicts within the campaign included the cavalry and artillery attack on Te Tarata pā near Opotiki in October 1865 in which about 35 Māori were killed, and the seven-day siege of Waerenga-a-Hika in November 1865. The government confiscated northern parts of Urewera land in January 1866 in a bid to break down supposed Māori support for Volkner's killers and confiscated additional land in Hawke's Bay a year later after a rout of a Māori party it deemed a threat to the settlement of Napier. War flared again in Taranaki in June 1868 as Riwha Titokowaru, chief of the Ngāti Ruanui's Ngaruahine hapu (sub-tribe), responded to the continued surveying and settlement of confiscated land with well-planned and effective attacks on settlers and government troops in an effort to block the occupation of Māori land. Coinciding with a violent raid on a European settlement on the East Coast by Te Kooti, the attacks shattered what European colonists regarded as a new era of peace and prosperity, creating fears of a "general uprising of hostile Māoris". Titokowaru, who had fought in the Second Taranaki War, was the most skilful West Coast Māori warrior. He also assumed the roles of a priest and prophet of the extremist Hauhau movement of the Pai Mārire religion, reviving ancient rites of cannibalism and propitiation of Māori gods with the human heart torn from the first slain in a battle. Although Titokowaru's forces were numerically small and initially outnumbered in battle 12 to one by government troops, the ferocity of their attacks provoked fear among settlers and prompted the resignation and desertion of many militia volunteers, ultimately leading to the withdrawal of most government military forces from South Taranaki and giving Titokowaru control of almost all territory between New Plymouth and Wanganui. Although Titokowaru provided the strategy and leadership that had been missing among tribes that had fought in the Second Taranaki War and his forces never lost a battle during their intensive campaign, they mysteriously abandoned a strong position at Tauranga-ika Pā and Titokowaru's army immediately began to disperse. Kimble Bent, who lived as a slave with Titokowaru's hapu after deserting from the 57th Regiment, told Cowan 50 years later the chief had lost his mana tapu, or sacred power, after committing adultery with the wife of another chief. Once Titokowaru was defeated and the East Coast threat minimised, the alienation of Māori land, as well as the political subjugation of Māori, continued at an even more rapid pace. Te Kooti's War was fought in the East Coast region and across the heavily forested central North Island and Bay of Plenty between government military forces and followers of spiritual leader Te Kooti Arikirangi Te Turuki. The conflict was sparked by Te Kooti's return to New Zealand after two years of internment on the Chatham Islands, from where he had escaped with almost 200 Māori prisoners of war and their families. Te Kooti, who had been held without trial on the island for two years, asked that he and his followers be left in peace, but within two weeks they were being pursued by a force of militia, government troops and Māori volunteers. The pursuit turned into a four-year guerrilla war, involving more than 30 expeditions by colonial and Māori troops against Te Kooti's dwindling number of warriors. Although initially fighting defensively against pursuing government forces, Te Kooti went on the offensive from November 1868, starting with the so-called Poverty Bay massacre, a well-organised lightning strike against selected European settlers and Māori opponents in the Matawhero district, in which 51 men, women and children were slaughtered and their homes set alight. The attack prompted another vigorous pursuit by government forces, which included a siege at Ngatapa pā that came to a bloody end: although Te Kooti escaped the siege, Māori forces loyal to the government caught and executed more than 130 of his supporters, as well as prisoners he had earlier seized. Dissatisfied with the Māori King Movement's reluctance to continue its fight against European invasion and confiscation, Te Kooti offered Māori an Old Testament vision of salvation from oppression and a return to a promised land. Wounded three times in battle, he gained a reputation for being immune to death and uttered prophecies that had the appearance of being fulfilled. In early 1870 Te Kooti gained refuge from Tūhoe tribes, which consequently suffered a series of damaging raids in which crops and villages were destroyed, after other Māori iwi were lured by the promise of a ₤5,000 reward for Te Kooti's capture. Te Kooti was finally granted sanctuary by the Māori king in 1872 and moved to the King Country, where he continued to develop rituals, texts and prayers of his Ringatū faith. He was formally pardoned by the government in February 1883 and died in 1893. A 2013 Waitangi Tribunal report said the action of Crown forces on the East Coast from 1865 to 1869—the East Coast Wars and the start of Te Kooti's War—resulted in the deaths of proportionately more Māori than in any other district during the New Zealand wars. It condemned the "illegal imprisonment" on the Chatham Islands of a quarter of the East Coast region's adult male population and said the loss in war of an estimated 43 percent of the male population, many through acts of "lawless brutality", was a stain on New Zealand's history and character. The New Zealand campaigns involved Māori warriors from a range of iwi, most of which were allied with the Kīngitanga movement, fighting a mix of Imperial troops, local militia groups, the specialist Forest Rangers and kūpapa, or "loyalist" Māori. Gustavus Von Tempsky, captain of the Forest Rangers. In 1855 just 1,250 Imperial troops, from two under-strength British regiments, were in New Zealand. Although both were scheduled to depart at the end of the year, Browne succeeded in retaining one of them for use in New Plymouth, where settlers feared the spread of intertribal violence. At the outbreak of Taranaki hostilities in 1860, reinforcements were brought from Auckland to boost the New Plymouth garrison, raising the total force of regulars to 450 and for many months the total number of Māori under arms exceeded the number of troops in Taranaki. In mid-April the arrival of three warships and about 400 soldiers from Australia marked the beginning of the escalation of imperial troop numbers. The buildup increased rapidly under Grey's term as governor: when the second round of hostilities broke out in Taranaki in May 1863 he applied to the Secretary of State in London for the immediate dispatch of three more regiments and also wrote to the Australian governors asking for whatever British troops that could be made available. Lieutenant-General Duncan Cameron, the Commander-in-Chief of the British troops in New Zealand, began the Waikato invasion in July with fewer than 4,000 effective troops in Auckland at his disposal, but the continuous arrival of regiments from overseas rapidly swelled the force. The Colonial Defence Force, a cavalry unit of about 100 men, was formed by Colonel Marmaduke Nixon in May 1863 and served in Waikato and militia forces were also used throughout the New Zealand wars. The Militia Ordinance 1845 provided for the compulsory training or service within 40 km of their town by all able-bodied European men aged between 18 and 60; the Auckland Militia and Volunteers reached a peak of about 1650 on active service in the early stages of the Waikato campaign; and the last force—the Taranaki Militia—was released from service in 1872. A special 65-man bush-scouring corps, the Forest Rangers, composed of local farmers who were familiar with the bush, had proven guerrilla techniques and were capable of "roughing it", was formed in August 1863; the Forest Rangers split into two separate companies in November, with the second led by Gustavus von Tempsky and both served in Waikato and Taranaki. Other rangers corps during the New Zealand wars included the Taranaki Bush Rangers, Patea Rangers, Opotiki Volunteer Rangers, Wanganui Bush Rangers and Wellington Rangers. From September 1863 the first contingents of what was planned as 5,000 military settlers—recruited on the goldfields of Australia and Otago with promises of free grants of land confiscated from "rebel" Māori—also began service in the Waikato. By the end of October the number of military settlers, known as the Waikato Militia, had reached more than 2,600 and total troop numbers peaked at about 14,000 in March 1864 (9,000 Imperial troops, more than 4,000 colonial and a few hundred kūpapa). 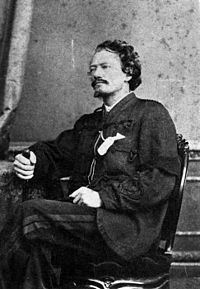 In November 1864 Premier Frederick Weld introduced a policy of "self-reliance" for New Zealand, which included the gradual but complete withdrawal of Imperial troops, who would be replaced by a colonial force of 1,500. The move came at a time of rising conflict between Grey, who sought more extensive military operations to "pacify" the west coast of the North Island between Taranaki and Wanganui, and Cameron, who regarded such a campaign as unnecessary, impractical and contrary to Imperial policy. Grey blocked Cameron's attempts to dispatch the first regiments from New Zealand in May 1865 and the first regiment finally embarked in January 1866. By May 1867 only the 2/18th Regiment remained in the country, their departure delayed by political pressure over the "peril" still facing settlers; the last soldiers finally left in February 1870. About 15 of the 26 major North Island tribal groups sent contingents to join the Waikato campaign, although sometimes they represented a single hapu, or clan, within the tribe. Continual presence on battlefields remained difficult for most, however, because of the constant need for tribal labour in their home community, so there was a constant turnover of small tribal groups. At Meremere, Paterangi, Hangatiki and Maungatatauri, between August 1863 and June 1864 Māori maintained forces of between 1,000 and 2,000 men, but troops were forced to disperse after each campaign because of labour and domestic needs at home. Belich has estimated that the total Māori mobilisation was at least 4,000 warriors, representing one-third of the total manpower available. Although they were not part of a structured command system, Māori generally followed a consistent strategic plan, uniting to build skilfully engineered defensive lines up to 22 kilometres (14 mi) long. Māori united under proven military commanders including Rewi Maniapoto and Tikaokao of Ngāti Maniapoto and Wiremu Tamihana of Ngāti Hauā. Campaigners on both sides of the New Zealand wars had developed distinctive war strategies and tactics. The British set out to fight a European-style war, based on engaging with the opposing forces, besieging and then capturing fortified positions. The British Army were professional soldiers who had experience fighting in various parts of the Empire, many from India and Afghanistan, and were led by officers who were themselves trained by men who had fought at Waterloo. Many of the Māori fighters had been raised during the Musket Wars, the decades-long bitter intertribal fighting during which warriors had perfected the art of building defensive fortifications around a pā. During the Flagstaff War Kawiti and Heke appear to have followed a strategy of drawing the colonial forces into attacking a fortified pā, from which the warriors could fight from a strong defensive position that was secure from cannon fire. The word pā means a fortified strong point near a Māori village or community. They were built with a view to defence, but primarily they were built to safely store food. Puketapu Pā and then Ohaeawai Pā were the first of the so-called "gunfighter pā", built to engage enemies armed with muskets and cannons. A strong, wooden palisade was fronted with woven flax leaves (Phormium tenax) whose tough, stringy foliage absorbed much of the force of the ammunition. The palisade was lifted a few centimetres from the ground so muskets could be fired from underneath rather than over the top. Sometimes there were gaps in the palisade, which led to killing traps. There were trenches and rifle pits to protect the occupants and, later, very effective artillery shelters. They were usually built so that they were almost impossible to surround completely, but usually presented at least one exposed face to invite attack from that direction. They were cheap and easily built—the L-Pa at Waitara was constructed by 80 men overnight—and they were completely expendable. The British repeatedly mounted often lengthy expeditions to besiege a pā, which would absorb their bombardment and possibly one or two attacks, and then be abandoned by the Māori. Shortly afterwards, a new pā would appear in another inaccessible site. Pā like these were built in the dozens, particularly during the First Taranaki War, where they eventually formed a cordon surrounding New Plymouth, and in the Waikato campaign. For a long time, the modern pā effectively neutralised the overwhelming disparity in numbers and armaments. At Ohaeawai Pā in 1845, at Rangiriri in 1863 and again at Gate Pā in 1864, British and colonial forces discovered that frontal attacks on a defended pā were extremely costly. At Gate Pā, during the 1864 Tauranga Campaign, Māori withstood a day-long bombardment in their underground shelters and trenches. The palisade destroyed, the British troops rushed the pā whereupon Māori fired on them from hidden trenches, killing 38 and injuring many more in the most costly battle for the Pākehā of the New Zealand Wars. The troops retired and Māori abandoned the pā. British troops soon realised an easy way to neutralise a pā. Although cheap and easy to build, a gunfighter pā required a significant input of labour and resources. The destruction of the Māori economic base in the area around the pā made it difficult for the hapu to support the fighting men. This was the reasoning behind the bush-scouring expeditions of Chute and McDonnell in the Second Taranaki War. The biggest problem for the Māori was that their society was ill-adapted to support a sustained campaign. A long campaign would disrupt food supplies and epidemics resulted in significant numbers of deaths among the Māori. While the British could defeat Māori in battle, the defeats were often not decisive. 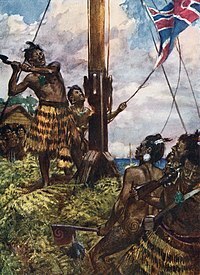 For example, the capture of Ruapekapeka Pā can be considered a British tactical victory, but it was purpose-built as a target for the British, and its loss was not damaging; Heke and Kawiti managed to escape with their forces intact. However the British force consisted of professional soldiers supported by an economic system capable of sustaining them in the field almost indefinitely, in contrast the Māori warrior was a part-time fighter who also needed to work on producing food. The main weapon used by the British forces in the 1860s was the Pattern 1853 Enfield. Properly described as a rifled musket, it was loaded down the barrel like a conventional musket but the barrel was rifled. While muskets were accurate to about 60–80 m, an 1853 Enfield was accurate to about 300 m to 400 m in the hands of an experienced soldier; at 100 m an experienced soldier could easily hit a human target. The rifle was 1.44 m long, weighed 4 kg and had a 53 cm socket bayonet. This rifle was also commonly used in the American Civil War by both sides. The Calisher and Terry carbine (short rifle) was ordered by the New Zealand Government from Calisher and Terry, Birmingham gunsmiths in 1861 after earlier fighting against Māori showed the need for a carbine suited to fighting in heavy bush. This was the favoured weapon of the New Zealand Forest Rangers because of its shortness, its lightness, and its ability to be reloaded while the marksman lay down—unlike the Enfield, which required the soldier to stand to load the powder—and could be loaded on the run. This feature led to a decisive victory for the New Zealand forces at Orakau: several groups of soldiers harried the fleeing Māori but only the Forest Rangers, equipped with carbines, were able to follow them 10 km to the Puniu River shooting as they went. Revolvers were mainly used by officers, but were a general issue for the Forest Rangers. The most common revolver appears to have been the five-shot Beaumont–Adams .44 percussion revolver. Other revolvers in use were the Colt Navy .36 1851 model with open top frame. The Colt was favoured by the Forest Rangers because it was light and accurate being a single-action revolver. Von Tempsky's second company of the Forest Rangers also used the Bowie knife. New Zealand Wars Memorial in Symonds Street, Auckland. The bronze statue at the base of the memorial is Zealandia. Large areas of land were confiscated from the Māori by the government under the New Zealand Settlements Act in 1863, purportedly as punishment for rebellion. In reality, land was confiscated from both "loyal" and "rebel" tribes alike. More than 16,000 km2 (6,200 sq mi) of land was confiscated. Although about half of this was subsequently paid for or returned to Māori control, it was often not returned to its original owners. The confiscations had a lasting impact on the social and economic development of the affected tribes. The legacy of the New Zealand Wars continues, but these days the battles are mostly fought in courtrooms and around the negotiation table. Numerous reports by the Waitangi Tribunal have criticised Crown actions during the wars, and also found that the Māori, too, had breached the treaty. As part of the negotiated out-of-court settlements of tribes' historical claims (Treaty of Waitangi claims and settlements), as of 2011 the Crown is making formal apologies to tribes. Edwin Bezar (1838–1936), last British soldier (and possibly last combatant). ^ "End of the New Zealand Wars". New Zealand Ministry for Culture and Heritage. Retrieved 16 April 2013. ^ "Story: New Zealand wars". ^ "The end of the war". ^ a b King, Michael (1977). Te Puea: A Biography. Auckland: Hodder and Stoughton. p. 26. ISBN 0-340-22482-7. ^ Dalton, B.J. (1967). War and Politics in New Zealand 1855–1870. Sydney: Sydney University Press. p. 179. ^ a b Belich, James (1986x). The New Zealand Wars and the Victorian Interpretation of Racial Conflict (1st ed.). Auckland: Penguin. pp. 204–205. ISBN 0-14-011162-X. ^ Belich, James (1986a). The New Zealand Wars. Auckland: Penguin. pp. 126–133. ISBN 0-14-027504-5. ^ Belich 1986a, pp. 24–25. ^ a b Belich 1986a, p. 126. ^ Dalton 1967, pp. 181–182. ^ Orange, Claudia (1987). The Treaty of Waitangi. Wellington: Allen & Unwin. pp. 32–33. ISBN 086861-634-6. ^ a b King, Michael (2003). The Penguin History of New Zealand. Penguin Books. p. 214. ISBN 0-14-301867-1. ^ a b Belich 1986a, pp. 125–133. ^ King 2003, p. 182. ^ Moon, Paul (2000). FitzRoy: Governor in Crisis 1843–1845|. David Ling Publishing. pp. 81–98. ISBN 0-908990-70-7. ^ Carleton, Hugh (1874). The Life of Henry Williams: "Early Recollections" written by Henry Williams. Vol. II. Early New Zealand Books (ENZB), University of Auckland Library. pp. 12, 28, 30–31, 35 ff. ^ Nicholson, John (2006). White Chief – The Story of a Pakeha Maori. Penguin Books (NZ). pp. 100–140. ISBN 978-0-14-302022-6. ^ Kawiti, Tawai (October 1956). Hekes War in the North. No. 16 Ao Hou, Te / The New World, National Library of New Zealand Library. pp. 38–46. Retrieved 10 October 2012. ^ Cowan, James (1922a). "Chapter 11: The Fight at Boulcott's Farm". The New Zealand Wars: A History of the Maori Campaigns and the Pioneering Period. Vol. 1, 1845–1864. Wellington: RNZ Government Printer. ^ Oliver, Steven (30 October 2012). "Te Rauparaha". Te Ara the Encyclopedia of New Zealand. Manatū Taonga Ministry for Culture and Heritage. ^ Cowan 1922a, Chapter14: The War at Wanganui. ^ Belich 1986x, p. [page needed]. ^ a b c Belich 1986a, pp. 125–127. ^ a b Belich 1986x, pp. 204–205. ^ Dalton 1967, p. 241. ^ "The Taranaki Report: Kaupapa Tuatahi" (PDF). the Waitangi Tribunal. 1996. ^ Dalton 1967, pp. 224–225, 240. ^ Cowan, James (1922b). "Chapter 11: East Coast Operations". The New Zealand Wars: A History of the Maori Campaigns and the Pioneering Period. Vol. 2, 1864–1872. Wellington: RNZ Government Printer. ^ David Morris, Speaker of the House of Representatives, March 1869, as cited by Belich. ^ a b Cowan 1922b, Chapter 29: (pp. 285–294). ^ Ranginui Walker, Ka Whawhai Tonu Matou – Struggle Without End, Penguin Books, 1990, chapter 8. ^ Binney, Judith (30 October 2012). "Te Kooti Arikirangi Te Turuki". Te Ara – The Encyclopedia of New Zealand. Manatū Taonga Ministry for Culture and Heritage. Retrieved 10 May 2014. ^ "The Mangatu Remedies Report" (PDF). Waitangi Tribunal. 23 December 2013. Archived from the original (PDF) on 16 February 2016. Retrieved 1 July 2015. ^ Dalton 1967, pp. 28–30, 52. ^ Dalton 1967, pp. 103–104, 108–110. ^ "New Zealand wars". Te Ara – The Encyclopedia of New Zealand. ^ Stowers, Richard (1996). Forest Rangers. Hamilton: self-published. pp. 1, 10–11, 34. ISBN 0-473-03531-6. ^ Dalton 1967, pp. 209–211, 218, 239. ^ Dalton 1967, pp. 227–230, 245, 275. ^ Belich 1986a, pp. 128–130. ^ Belich 1986a, pp. 131–133. ^ Cowan, James (1955). "Flax-masked Palisade". The New Zealand Wars: A History of the Maori Campaigns and the Pioneering Period: Volume I (1845–64). Retrieved 10 October 2012. ^ Belich 1986a, pp. 294–295. ^ Belich 1986a, pp. 106–107. ^ Belich 1986a, p. 239. ^ Rogers, Lawrence M. (1973). Te Wiremu: A Biography of Henry Williams. Pegasus Press. pp. 215–216. ^ Stowers, Richard (1996). Forest Rangers. Hamilton: self-published. p. 106. ISBN 0-473-03531-6. ^ Von Tempsky, Artist and Adventurer. King M and Rose G.1981. ^ Stowers, Richard (1996). Forest Rangers. Hamilton: self-published. pp. 270–283. ISBN 0-473-03531-6. ^ "Maori land loss, 1860–2000". New Zealand Ministry for Culture and Heritage. Retrieved 20 July 2010. ^ "Treaty of Waitangi". New Zealand Ministry for Culture and Heritage. Retrieved 20 July 2010. ^ "Turanga Tangata Turanga Whenua: The Report on the Turanganui a Kiwa Claims". Waitangi Tribunal. Archived from the original on 25 May 2010. Retrieved 20 July 2010. ^ "Ngāti Pāhauwera Treaty Claims Settlement Bill 273-2 (2011), Government Bill – New Zealand Legislation". legislation.govt.nz. 2011. Retrieved 13 September 2011. The Crown unreservedly apologises for not having honoured its obligations to Ngāti Pāhauwera under the Treaty of Waitangi (Te Tiriti o Waitangi) and through this settlement, the Crown seeks to atone for its wrongs and to begin the process of healing. The Crown looks forward to building a relationship with Ngāti Pāhauwera, based on mutual trust and co-operation, founded on the Treaty of Waitangi (Te Tiriti o Waitangi) and its principles. Barthorp, Michael (1979). To Face the Daring Māori. Hodder and Stoughton. Belich, James (1996) Making Peoples. Penguin. Binney, Judith (1995). Redemption Songs: A Life of Te Kooti Arikirangi Te Turuki. Auckland: Auckland University Press. Green, David (2010). Battlefields of the New Zealand Wars: A Visitor’s Guide. Auckland (North Shore): Penguin. ISBN 978-01432-0-4183. Lee, Jack (1983). I have named it the Bay of Islands. Hodder and Stoughton. Lee, Jack (1987). Hokianga. Hodder and Stoughton. Simpson, Tony (1979). Te Riri Pākehā. Hodder and Stoughton. Stringfellow, Olga (1960). Mary Bravender. Fictional treatment of the New Zealand Wars as seen through the eyes of a young Englishwoman. Vaggioli, Dom Felici (2000). History of New Zealand and its inhabitants, Translated by J. Crockett. Dunedin: University of Otago Press. (Original Italian publication, 1896). Walker, Ranginui (2004) Ka whawhai Tonu Matou: Struggle Without End Penguin. "The People of Many Peaks: The Māori Biographies". (1990). From The Dictionary of New Zealand Biography, Vol. 1, 1769–1869. Bridget Williams Books and Department of Internal Affairs. Wikimedia Commons has media related to New Zealand land wars. This page was last edited on 20 April 2019, at 08:48 (UTC).